Know to be the ultimate AR 15 scope or optical system is the ACOG or Advanced Combat Optical Gunsight. This kind of scope is specifically designed for ARs and was made initially for military and police purposes. Basically, scopes of this kind are widely issued and used by the US Army and the Marine Corps of the United States, receiving an enormous acceptance among both troops in the process. The ACOG fulfills a wide range of roles which include hunting, shooting competition and self-defense. This means that the ACOG is widely accepted by people around for a variety of uses and purposes. Ideally, ACOG does not come as single-scoped but it is designed with a myriad of optical systems for certain calibers and missions. Here, we will be dealing with the three best AR 15 ACOG scopes you might want to get for your particular purposes. While the current market comes with a wide range of selections to choose from, we made sure that our list contains the best ones in which you can choose from. Picking the best one also becomes much easier at your end with the following criteria: complexity, precision, durability and cost. ACOG 4 X 32 Scope Dual Illuminated Crosshair .223 Ballistic Reticle. This scope is far superior to using iron sights simply because it comes with a couple of optics, making it as an excellent choice for home defense purposes. It has the 4 power ACOG and a .32mm objective lens. On top of it is the mounted ruggedized miniature reflex sight, only from Trijicon. It’s a small 1 power optic with open sight and holographic features. It also makes use of a 2-eyed aiming method known as the Bindon aiming concept, a feature that allows a 4x optic to be used similarly as a red dot. ACOG 3.5 X 35 Scope Dual Illuminated Crosshair .308 Ballistic Reticle. IN terms of accuracy, precision and distance it is difficult to beat the 7.62 x 51mm or 308 round. It’s a powerful 30-caliber cartridge which is the favorite among AR users. In this regard, Trijicon has made it possible to come up with a 308 ballistic reticle. It features a 3.5 fixed power optic with an objective lens of 35mm. It is designed to fit and suit flat top AR rifles and is calibrated for up to 1,200 meters, making it as an excellent choice for shooting competitions. Trijicon TA31F 4×32 ACOG with Dual Illuminated Chevron .223 Ballistic Reticle. This ACOG scope comes with a battery-free, day/night dual illuminated Chevron Bindon Aiming Concept or BAC reticle. It provides daytime and nighttime optics with its tritium phosphor lamp used for nighttime illumination. It also features bullet-drop compensation (BDC), broadband anti-reflective coated lenses, fogproof and waterproof construction and military-grade aluminum housing. ACOG 4 X 32 Scope Dual Illuminated Crosshair .223 Ballistic Reticle. Precision is something that you can achieve with this scope from Trijicon as it comes with a two-eyed aiming method which is known as the Bindon aiming concept, allowing its 4x optic to be used similarly as red dot. With two eyes opened the scope’s reticle is imposed on your vision and acts like a red dot. To further enhance precision and accuracy, RMR is purposely mounted over the ACOG to ensure rapid movement, allowing you to easily put the dot on the target and pull the trigger without the hassle. ACOG 3.5 X 35 Scope Dual Illuminated Crosshair .308 Ballistic Reticle. This scope is calibrated for .308 flat top rifles that can shoot as far as 1,200 meters. It comes with daytime and nighttime illumination that can help you achieve a high level of precision during the day or during the night. This makes a perfect scope for those who are using heavier rifles for competition such as the heavy metal class of three-gun competition. The heavy metal class commonly requires .308 so as to ensure a high sense of precision for every shoot. Trijicon TA31F 4×32 ACOG with Dual Illuminated Chevron .223 Ballistic Reticle. Your shooting excitement may happen during the day or during the night so this scope makes a perfect choice for your AR. It comes with a tritium phosphor lamp that ensures nighttime illumination that you can rely on even when your shooting purposes are to be done even in the darkest of the night. Its tritium lamp is warranted to glow for fifteen years so this is something you can count on when it comes to providing you with a continuous and precise shooting experience without the interruptions. ACOG 4 X 32 Scope Dual Illuminated Crosshair .223 Ballistic Reticle. This scope from Trijicon is something that you can rely on when it comes to durability. In fact, its housing is made of forged aluminum, making you feel certain that you will be using an ACOG scope that is truly strong, powerful and durable. ACOG 3.5 X 35 Scope Dual Illuminated Crosshair .308 Ballistic Reticle. Like its other Trijicon counterparts, this scope is also something you can count on when it comes to durability. It is made from high quality materials that will definitely last. It also comes with a BAC manual 1 warranty card, making you feel sure that your scope is covered. Trijicon TA31F 4×32 ACOG with Dual Illuminated Chevron .223 Ballistic Reticle. Made from high quality materials, this scope from Tritium has a tritium lamp that you can expect to glow for fifteen years. It is also a riflescope which is warranted for life to be free of defects in materials and workmanship. ACOG 4 X 32 Scope Dual Illuminated Crosshair .223 Ballistic Reticle. 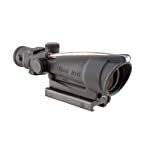 This scope is priced at below two thousand bucks, making it as an excellent choice if you are looking for a high-end scope and if you are willing to spend more. ACOG 3.5 X 35 Scope Dual Illuminated Crosshair .308 Ballistic Reticle. This scope is tagged with a price of less than one thousand four hundred bucks; basically stays in the middle of the two other options when it comes to price. Trijicon TA31F 4×32 ACOG with Dual Illuminated Chevron .223 Ballistic Reticle. This scope happens to be the best choice when it comes to price. In fact, its price is just less than one thousand and twenty bucks, a great pick for a scope that you can trust. Basing from the review, it is obvious to note that the Trijicon TA31F 4×32 ACOG made it to be the best one as it scored higher in terms of durability and cost. However, the two other options are equally good as well especially when you are willing to spend more for a high-end ACOG scope.